I’m not very good at putting. I’m thinking of spending a lot of time practicing my putting to improve. Do you have some thoughts on how I should go about doing that? If you practice your putting a lot doing the wrong things, you’ll get worse instead of better. So it’s great you’ve asked this question before embarking on a putting practice regime. I’m a firm believer in NOT practicing perfecting your putting stroke on the putting green. Because the putting green is imperfect. 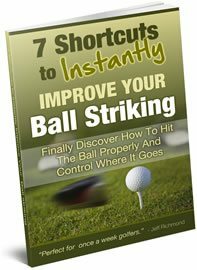 So if you stroke a ball with a bad putting stroke and the ball goes in, then you’re very likely to groove that bad putting stroke. So instead, you should practice your putting stroke at home in some very controlled conditions. Ok, so what should you do on the practice putting green to improve your putting stroke? For speed control there are so many different drills you can do for this, but here’s one. 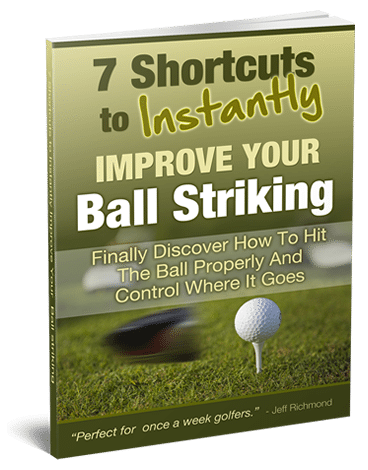 Simply practice hitting balls to the fringe of the green from all distances. When you do this, try to get the ball to finish close to the fringe without going off the green. Like speed control, with green reading there’s many different drills you can do. But one easy one is to select a very slopping putt, and put a gate about 3 feet in front of your ball (do this with two tees) on a line that you think your ball needs to travel on to go in the hole. Then hit balls through your gate. When you do this you’ll be shocked with how much of the time you under-read your putts. On mental toughness you need to do drills that put the pressure on. For example, get 10 balls and vow not to leave the putting green until you’ve holed 10 putts in a row from 5 feet. So in summary, don’t try to improve your putting stroke on the practice putting green. But instead work a lot on speed control improvement, green reading improvement and improving your mental toughness. If you do these 3 things, you’ll notice a big improvement in your putting results on the golf course.